After an extended commissioning period, rebuilt Class 73/9s are taking over Caledonian Sleeper portions in Scotland. John Heaton FCILT samples the performance of these locos with a trip over the testing Highland Main Line. It is the wee small hours at Edinburgh Waverley, but the station is a hive of activity. There used to be nothing unusual about such a statement, but the loss of parcels traffic and the handling of the remaining Royal Mail at purpose-built terminals have resulted in most stations falling silent, and even closing, in the hiatus between first and last local passenger trains. Not so in Scotland’s capital city when the Caledonian Sleepers are around. 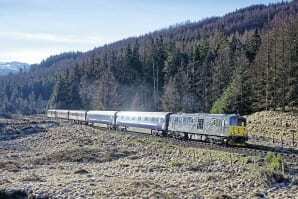 There are two pairs of sleeping car trains between London and Scotland, starting their journeys on Sunday to Friday evenings. One is known colloquially as ‘The Lowlander’, departing each end just before midnight to give a business-friendly arrival time. The other is the former ‘Royal Highlander’, serving the diverse triple markets of Aberdeen, Fort William and Inverness in a giant train that combines southbound, and divides northbound, at Edinburgh.